Our snowy girl from the arctic was released on Friday, December 12th, about 2pm in Berks County. The PA Game Commission helped locate the perfect release site for her. Peggy, Red Creek’s founder, has been rehabilitating wildlife for 23 years. In all that time, no snowy was ever presented to Red Creek for rehabilitation. With the release of this bird, Red Creek has now rehabilitated and released every species of Pennsylvania owl. Harrisburg Patrol Officer Chris Thomas saw the snowy owl perched on top of Harrisburg Hospital. A few days later, he was dispatched to downtown Harrisburg when someone reported a snowy owl on the ground in distress. Thomas found the owl sitting on the sidewalk, staring. Thomas, who grew up on a farm and had seen birds dazed from flying into windows, asked for a blanket and placed it on the bird’s wings to keep it calm. He knew putting the owl in his patrol car would distress it, so he picked it up and carried it to the station a few blocks away. The police kept the bird in an old dog crate covered with a blanket inside the station’s garage, then called around to see who could pick her up. Peggy Hentz, founder and director of the Red Creek Wildlife Center in Schuylkill Haven, answered the call. The owl, an adult female, had a concussion and needed cage rest and nutrition to heal, said Hentz, who has been rehabilitating injured wildlife for 23 years. The center, one of 30 in the state, treats more than 1,000 animals a year, from baby raccoons to orphaned deer and birds of prey. Hentz suspects the owl flew into a building. They fed her mice to try to match her usual diet of lemmings, another type of small rodent. 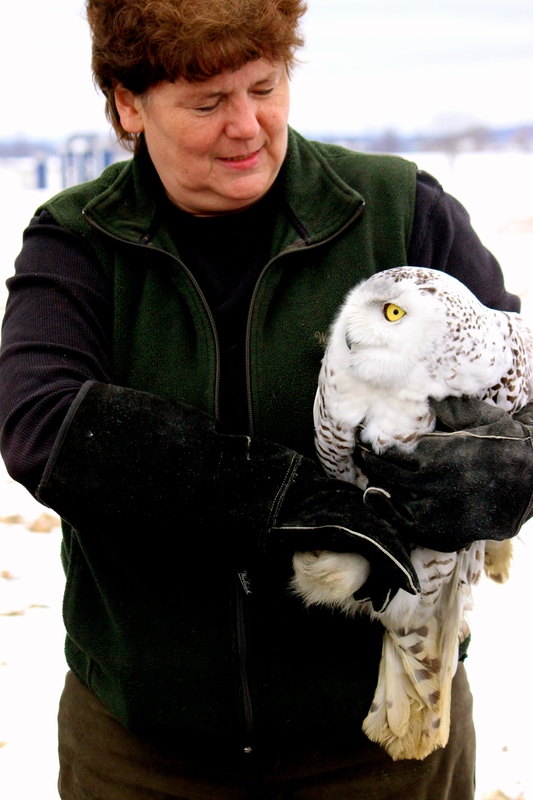 The snowy owl is the first treated at Red Creek, and with it the center can now say it has treated every species of owl in Pennsylvania, Hentz said. Snowy owls usually only visit Pennsylvania for the winter, leaving sometime in February. Snowy owls, which are tundra avian predators, rarely leave the Arctic, but in the last couple years sightings of the bird in the Mid-Atlantic region have increased, a phenomenon bird watchers call an irruption. A snowy was seen, and eventually fitted with a GPS collar, near Womelsdorf last year. 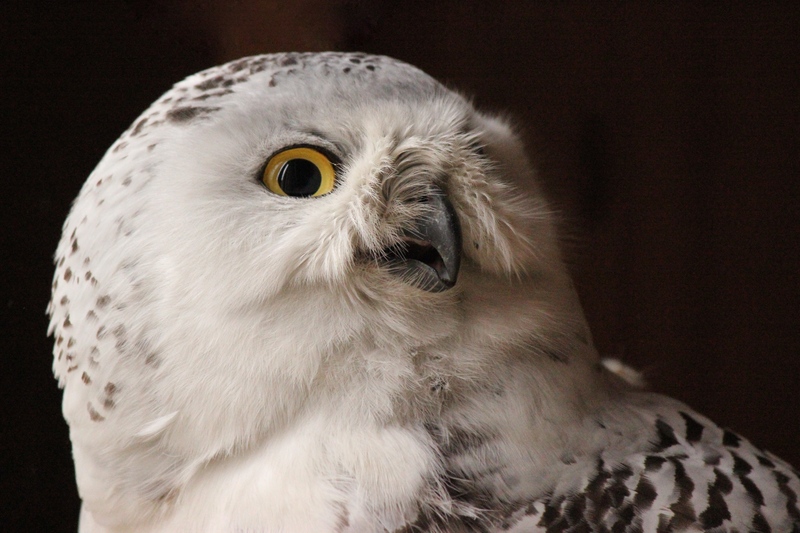 Scott Weidensaul, co-director of Project SNOW Storm, a research program that collects data on snowy owls, said there were hundreds in Pennsylvania last winter. The Harrisburg owl was recovering quickly at Red Creek last week. Hentz and Greg Nason, a rehabilitation assistant at the center, moved the owl from a small cage to a larger pen. She was kept in the small cage to rest her wings, but after several strong test flaps she was moved to a larger pen. “He’s definitely a lot stronger than he was,” Nason said, before they learned the owl was a female. Sometime this week Hentz expects to release the bird. Weidensaul, who banded the owl Monday, said he expects she will wander around near her release site. “It’ll find a place that makes it comfortable,” he said. Snowy owls typically look for two things in potential winter homes: somewhere that looks like home, with wide, flat, open spaces, and somewhere where there’s food. For example, he’s known snowy owls to eat small mammals like lemmings and mice, but also ducks and geese. But the owls do not have a fear of humans, which gets them into trouble. Most snowy owls that die over winter don’t die from natural causes. They are hit by planes or cars, or fly into electrical lines. 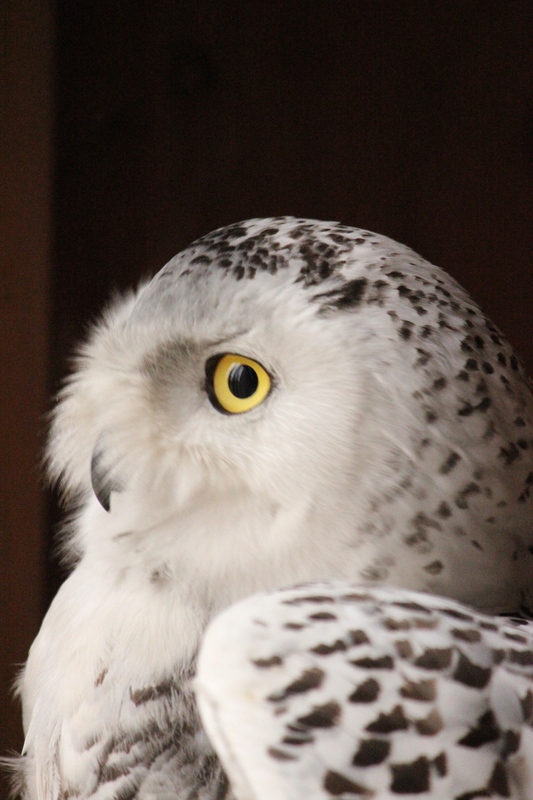 Like Hentz, Weidensaul thinks Red Creek’s snowy owl may have flown into a building. “She hit something dirty, that’s for sure,” he said.